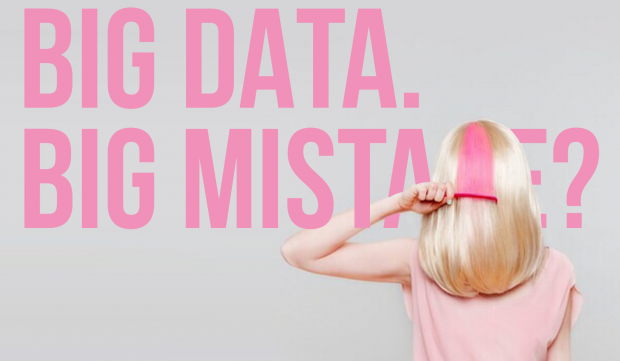 Our obsession with data is bigger than ever. It has led to amazing discoveries crucial in the field of scientific research. Without big data we would have never discovered the Higgs particle (a.k.a the elusive God particle). Big data has seeped deep into every particle of society. Our behaviour as individuals and groups is constantly collected and analysed to predict our future political, social, environmental and legal actions. Minority Report (directed by Steven Spielberg in 2002) is set in a future where a special police unit is able to arrest murderers before they commit their crimes. A nice example how big data made it from Hollywood science fiction to everyday reality. In our field of expertise brands and retailers also discovered the quick wins that can be gained through big data. Based on gigantic amounts of consumer data supermarkets can now predict quite accurately what will be the ideal weekend for people to plan a family BBQ. Online retailers like Zalando and ASOS use big data to guide people through the shopping process and propel them to the check out with as many items in their shopping trolley as possible. They have turned shopping analytics in a major field of study and graduated with honours in online consumer behaviour. These brands quickly discovered that while big data is plentiful and easy to collect, the real value is in the analytics. By now we’re all familiar with ‘best practice’ cases where we place the call-to-action above the fold and create visual cues to influence the click behaviour of the consumer. All great because big data shows us that it works. Ignoring these numbers would be like standing in the middle of a highway with earplugs in and a blindfold over our eyes. But…in the long run we must not forget that big data is always based on previous experiences and more important: you can only measure what you can measure. In some cases this is still better than nothing. But don’t make the mistake that big data gives you a deeper understanding of someone’s life choices. Many things can simply not be reduced to numbers. As a matter of fact. Big data is useless when it comes to the most important things in life. For example it cannot predict how we will react to a certain stimulus because it doesn’t understand our private emotions and therefore doesn’t know what kind of behaviour it triggers (positive or negative) when something reminds us of someone or something. Because big data is fixated on the past there is a high risk that people will use it only to confirm stereotypes (Yes, Mister President!). Big data doesn’t show us the unexpected and endless possibilities our future holds. People change, people learn and people grow. The only thing that is constant is change itself (Heraclitus). Timandra Harkness (BBC journalist and author of Big Data: does size matter) says that it is easy to hide behind big data. In a way it allows people to give up their own responsibility. It is almost as if we don’t trust ourselves to make the right decisions anymore and it’s safer to let big data make the judgement. At DEARDAN&Friends we advise our clients to create diversity in every campaign because different people have different motivations…simple! We use big data and psychological profiling to come up with unique insights about the people we are reaching out to. We want to get as close as possible to really understand what makes people tick. We create our campaigns based on these insights and use big data to optimise the campaign results. This seems to work in our advantage because results show that we continue to hit the right spot with our audiences and succeed in motivating them to take the desired action. Over the last couple of years we have specialised in creating real advertising for real people. Big data is essential to our work but in order to surprise, inspire and motivate people you first have to make the effort to really understand them and then find a creative way to make that connection last. Want to know more? Check out deardanandfriends.com or keep an eye out for our latest campaign heldenvoordeklas.nu (heroes-in-the-classroom).